After it was announced in September that Bloglines was shutting down (although Chris knew better), I sadly and reluctantly started testing replacements. 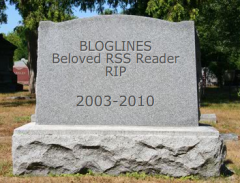 So you'd think that the recent announcement that Bloglines will continue after all would send me tearing back, right? The answer, actually, is no - and I think there's a lesson in there for libraries. When Ask.com announced they were ending Bloglines, that's what they said - service will be terminated. They didn't say they were looking to spin it off, or really give its users any obvious signs of hope. The deadline extensions implied they were exploring ways to continue the service, but my feeds were too important to me to sit around and hope. After evaluating a few alternatives, I switched to Netvibes. And now that I've invested a month tweaking it and getting comfortable with it, the idea of switching again - even back to something "familiar" - is just not appealing and I'm not going to do it. I say "familiar" after reading about the future plan for Bloglines - fewer features and more ads. To me, this indicates a shift in focus, from "user as customer" to "user as product" (meaning, "what's good for me" versus "what's good for them") - which gives me zero incentive to use it anymore*. My gosh, why is this all sounding so bitter? I'm really not, I promise. I just think this is a good cautionary tale on how easy it is to lose support - and support is everything to libraries. *Incidentally, this is, as I see it, exactly the business model Facebook uses (and exactly why I don't use Facebook). All the ways Facebook's users' privacy is violated can be traced back to it - the more information about you they sell to advertisers, the more money they make. Facebook's customers are its advertisers, and Facebook users are the product. **Sunday hours might be a bad example - we could be open only even-numbered Sundays in odd-numbered years when the temperature is greater than the square root of 1764, and we'd still be busy. This week's reference question is one of my own. I use Bloglines to read rss feeds, and a couple weeks ago they changed their interface. I didn't like the changes, so I used their Contact Form to express this and ask if there was an option to change it back. This was two weeks ago, and I still haven't gotten a reply. Then it occurred to me that perhaps Bloglines used Twitter, and maybe I could ask them that way. I found an @bloglines user, but even though he's using the Bloglines logo, he indicates it's not an official Bloglines account. I asked him my question anyway (noticing he was fielding the exact same question a lot lately), and got a reply in 5 hours. And best of all, his suggestion worked perfectly, and now I'm back to using Bloglines happily, the way that suits me best. But this experience got me thinking. It's easy for organizations to let email messages slide, because only that one person knows they sent it in. But Twitter is public, and if someone is questioning or complaining, ignoring it won't make it go away. Unofficial or not, @bloglines did exactly what I would have expected an organization to do - respond quickly and helpfully. This is what librarians do, and it reminded me of Kate's post about their library suggestion box. I like that she's publicly displaying suggestions and answers, because in this case, one-to-many communication seems better than one-to-one. So I thought, why not encourage patrons to use Twitter as a suggestion box? Being public, the library has to address patrons' concerns, but it also means all patrons can benefit from the answer, rather than just one. I know a public forum isn't appropriate for every issue, and anonymity can be necessary, so I think traditional suggestion boxes (whether physical or online form) are still useful. But I bet there are some libraries already doing this very thing. I know I came late to Twitter, but it really is turning out to be a very useful tool after all.